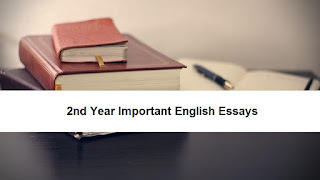 If you are looking for some 2nd Year Important English Essays then you will never get a list of those important essays which are really going to be in the annual exams of 2nd year and one of these will be there so that you can easily write them. So read out the list of 2nd Year Important English Essays and guess your paper so that you can easily get more marks. If you are looking for more essays and guess papers then share this article with your friends and stay connected with us. We will guide you on your exam preparation.